The Denver Zoo also houses orangutans that are not listed at the sub species level. The species name for these orangutans is Pongo pygmaeus. Preferred habitat of the Sumatran orangutan is in tropical rainforests, mangroves, swamp forests, and riparian forests. This species can be found from 650-4,900 feet (1,000 -1,500 m). The Sumatran orangutan is located only in Northern Sumatra (Indonesia). Orangutans spend most of their lives in trees and have special adaptations for their arboreal lifestyle. They have extremely long arms, mobile shoulders and strong upper muscles that allow them to swing through the trees with ease. They have long narrow hands and feet that are suitable for grasping branches. Although they have opposable digits on their hands and feet, the thumb and big toe are short, which helps their hands and feet easily hook over branches as they move through the trees. Orangutans find most of their food in the trees, travel through the forest high up in the trees, build sleeping nests in the trees every night and even mate in the trees. Orangutans are highly intelligent and have comparatively larger brains compared to other primates. Wild orangutans have developed an amazing ability to use tools to obtain food. They use probes like twigs to extract insects and honey from tree trunks and blunt tools to scrape seeds from spiny fruit. They fashion leafy branches into umbrellas to shelter themselves from sun or rain. In captivity, they can be trained to communicate with sign language and are well known for their ability to dismantle their enclosures or even attempt escape. Unlike the other great apes, orangutans are solitary except for females with offspring. Fruit is their favorite food. Since this food source tends to ripen seasonally it is therefore irregular and widely distributed. Foraging for fruit is highly competitive and each area can support only a limited number of orangutans. A solitary lifestyle spaces orangutans throughout the forest enabling them to find enough food. Male orangutans are about four-and-a-half feet (1.3 m) tall, females are up to three-and-a-half feet (1 m) tall. Males weigh 130-200 pounds (59-90 kg), females weigh 88-110 pounds (40-50 kg). Orangutans have long, coarse hair up to three feet long, ranging in color from bright orange in young animals to dark maroon in older animals. Arm span in males can be over seven feet (2 m) from fingertip to fingertip. Adult males have large cheek pads and grow long mustaches and beards as they age. In the wild: Fruit, leaves, shoots, insects, eggs, and small vertebrates. The Sumatran orangutan was traditionally preyed on by tigers and snow leopards. Orangutans are mostly solitary except for mating pairs and females with offspring. Encounters between mature males can result either in aggression or avoidance. Females are more tolerant and may be seen with other adult females or adolescents other than their own. Wild orangutans are almost arboreal. Adults and juveniles will play in social settings or alone. Orangutans mature slowly. Females are mature at eight to ten years of age but generally do not bear their first offspring until they are 14 to 16 years old. Males are sexually mature at 13 to 15 years of age. Females are in estrus only a few days a year during which mating can occur. After a gestation of 260-270 days females give birth to a single offspring weighing three to four-and-a-half pounds (1.3-2 kg). Infants are carried by their mothers for two to three years and nursed for up to six or seven years. A female will bear young every eight or nine years and will raise only three or four young during her lifetime. Both female and male offspring go off on their own once they reach maturity. Orangutans may live up to 35-45 years in the wild and up to 50 years in captivity. Orangutans are the largest tree-living mammals in the world. 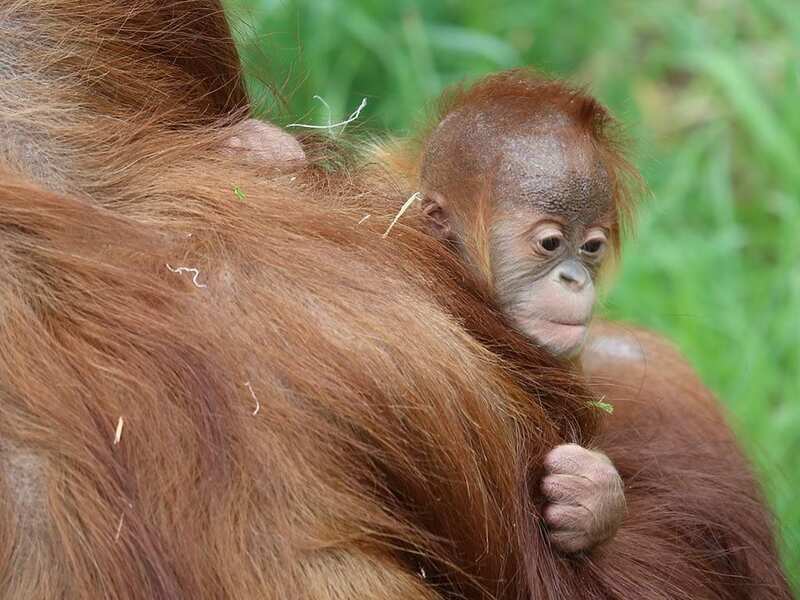 Except for humans, orangutans have the longest childhood of any animal in the world. In the Malay language, the name “orangutan” means “person of the forest”. Orangutans have the most mobile lips and mouths of all the great apes; they are capable of many facial expressions. There are two distinct species of orangutans – Sumatran and Bornean. They live on separate islands in the South Pacific and look very different. Sumatran orangutans are critically endangered with only about 9,200 left in the wild. The primary reason orangutans are endangered is habitat loss due to logging, forest fires and timber clearing for agriculture (including palm oil plantations) and human settlements. Orangutans are also hunted and killed for bush meat and captured for the pet trade. Although international efforts are underway to try to protect the remaining orangutans, if current trends continue, orangutans may be extinct in the wild within a decade.